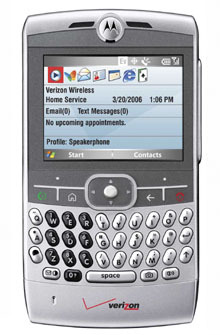 Motorola Q - a RAZR slim smartphone with QWERTY keyboard has definately become a popular device long before its commercial launch. FCC images from its approval by the FCC last year showed it with Verizon branding. Last month even Motorola put a page up on their website which had the Q "coming in Arpil" label. Now image of the phone is even on the Verizon's website (shown below), so hold we hold our breath and expect the official launch soon.